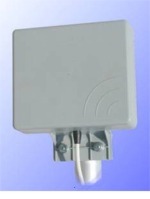 The SMP-918-9 is a mini panel directional antenna covering the 900/1800 and 2100 MHz bands. It is housed in a UV treated radome and is designed for mast mounting though a wall mounting bracket is optional. The SMP-918-9 offers 9 dBi of gain and better than 2:1 VSWR. Supplied with 9.5m WBC195 Cable with SMA(f) to SMA(m) connector - Other connectors available on request.